It was rumored last January that Gmail and Gtalk would be banned. It is confirmed now. Many of my friends were frustrated. An official from Bagan Cybertech, the country's only Internet service provider, confirmed that both Google and gmail were inaccessible but declined to comment further. I truly hope that they will reconsider this. Search for keywords "gmail lite links" or anything related to gmail lite and you can find some links to check gmail (which are intended for mobile devices). 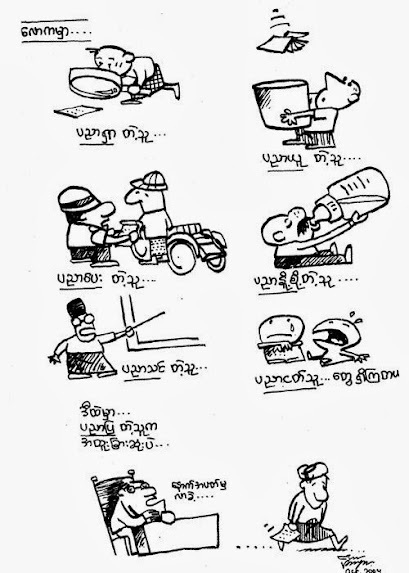 This joke is for Burmese people only :-) Sorry if you can't read Burmese. I got this from Mg Hla's blog. 69 Burmese women were sold for as much as 20,000 yuan ($2,500) each in China. According to a report by Reuters, Chinese police in the poor, inland province of Henan have rounded up 69 women from Burma who were sold to farmers unable to find local wives, quoting a Chinese newspaper report. The women were smuggled into Xincai county from Burma some 4,000 km away, and sold for as much as 20,000 yuan ($2,500) each. Sawadee Khrap (in Thai), Min Ga La Bar (in Burmese), How are you (in English :-) ? It was hot and humid outside. The rain is so scanty in Bangkok. It is nothing comparable to Burmese rain forest. The cloudy sky made the weather hotter and more humid. Eighty degrees Fahrenheit plus 85 % relative humidity is something not pleasant to bear. I think it's time for me to write something about current status of Myanmar Unicode fonts. Recently I have been seeing many people using ZawGyi-One Unicode font on some blogs. So I installed that font on my system. I also had MyaZedi font installed. Yesterday, I installed a new one, MyMyanmar Unicode font. What I found out was that since they used different partial encodings, it messed up my Burmese language display. It's very bad that they all use their own partial encodings, not fully compliant to true Unicode standard. Padauk is the one and only almost-truly-Unicode-compliant. The only problem with Padauk is they use Graphite rendering engine. You need to install a special build of Graphite-enabled Firefox. Graphite rendering is slow for a very long Burmese page. And if you type in Padauk using Microsoft Word, it won't render correctly. You will also need a special Graphite-enabled word-processors such as OpenOffice. This Myanamr unicode font is said to be truly unicode compliant. 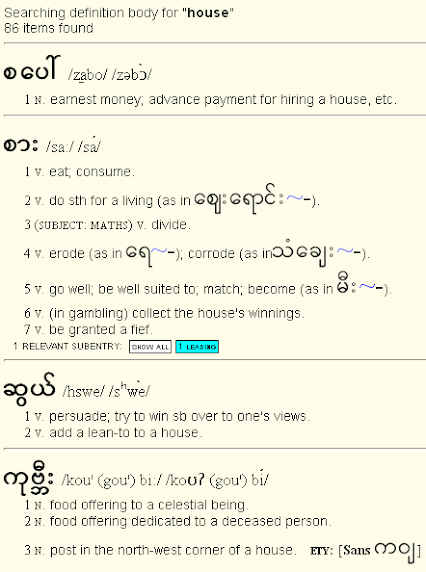 Here is their font rendering our Burmese-English dictionary site correctly. Our dictionary will be released online soon here:http://www.sealang.net. Right now, we are still doing development work on it. Countless hours of Perl coding! I am right now watching a documentary called "China - Children of Blessing" on Australian TV. The documentary is about Lahu girls attedning urban Chinese schools. It reveals how China assimilates its minorities. Actually, Lahus are not only China's minorities. They also live in Burma. Today's globalization has caused huge pressure on ethnic minorities to conform. I hope their cultural identity wouldn't be lost. The girls work hard determined to make their parents and Miss Peng proud. They sweep the boards in the games and score the highest in the Chinese exams. They should be happy but are they? They were lured into China with the promise of a better life. But over the past year, they've learnt they can only have this on Chinese terms.